You reset your Apple AirPort Extreme or Time Capsule. You try to connect with AirPort Utility. You get error -6753. You google for it and find that lots of people has this problem but nobody seem to have a solution. As you see there is a prompt to connect (I wish it just could connect without asking!). Two buttons are selected in some way: one has full glow, another has outer glow. It means that one of the will act on space key, the other – on Enter key. Which one will act on what key? This question always makes me stop and think. Remembering excellent Steve Krug's book named "Don't make me think", I see such selection as a usability mistake by Vodafone. Obviously I wish to connect if I plugged in my modem! But how do I do that without pressing wrong button and without using mouse? I have to think for 10 or more second and guess that Enter key will probably apply the fully glowing button. May be it will, yeah. May be... What if not? I never try to remember such details because they take my brain's RAM and they are not what I should be thinking of. My experience should be different in this case: the program should provide a single selection, which is the most appropriate and desired by the user. Which one? Obviously to connect! Why else would I plug the modem? This kind of mistakes quite common. It comes from the programmer's wish to give more choices to the user. Good wish but wrong. It makes people think to make the choice to the obvious one. 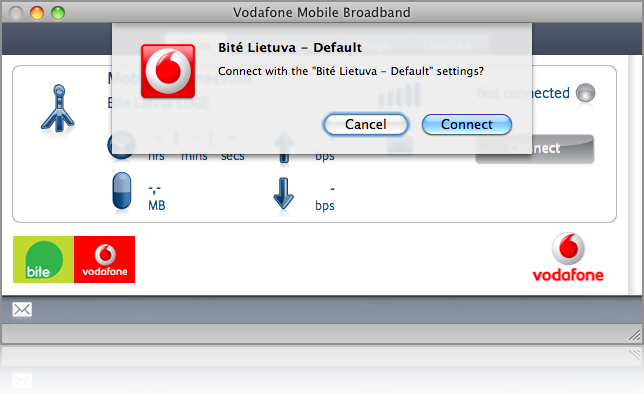 Don't make me think, Vodafone!